A Eicher vehicle bearing number WB 73B-4368 met with an accident in the wee hour today morning. The ill-fated vehicle was coming to Kalimpong with bricks loaded in it which skidded about 20 ft down from the road at NH 10 Birik Dara. The area comes under the Jurisdiction of Reang police post which got information around 6 am in the morning. The vehicle may be have lost control in the sharp turning . The body of the driver was half out of the vehicle but under the after which the driver try to came out but remained half pressed outside the vehicle. 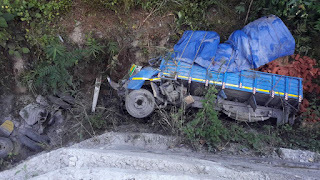 Later members of the Kalimpong Main Line Truck Chalak Association reached the spot and took out the dead body of the driver who has been identified as Chandra Kumar Sunar of 15th Mile Kalimpong. Later the dead body was sent for Post mortemat Kalimpong Sub Divisional Hospital. 0 Respones to "Kalimpong Truck mets with accident , driver dead"